Karin specialises in litigation with the focus on U.S. and international litigation. 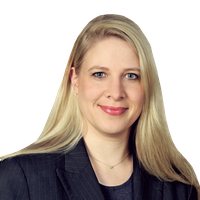 Karin advises companies on issues that arise in cross-border litigation, including jurisdictional challenges, Hague Convention issues and other matters. She has extensive experience with U.S. discovery/electronic discovery. She guides clients through both the discovery preparedness planning (document management and retention policies) and the actual discovery process. She also specializes in data protection compliance and internal investigations. Karin also counsels clients in the area of product liability, product safety and risk management. Her experience includes all stages of U.S. litigation, such as formulating and implementing case and trial strategies, handling multi-state and international discovery, taking and defending depositions, preparing expert and company witnesses for deposition and trial, writing and arguing motions and engaging and managing local counsel.